“As long as people keep talking about me, I’m happy.” Former reality-TV contestant and current fashion designer/celebrity reporter Summer Young lives by those words. Since her time on the “Ragged Royalty” program Summer’s been looking for her big break in either fashion or show biz, whichever will let her show her family of literal geniuses that she can still be a success without being smart. Touched to be asked to help her ex-husband Kent and his crazily private fiancée Madeleine-Cora plan their nuptials, Summer throws herself into taking charge of everything and being the perfect bridesmaid and even making MC’s bridal gown. 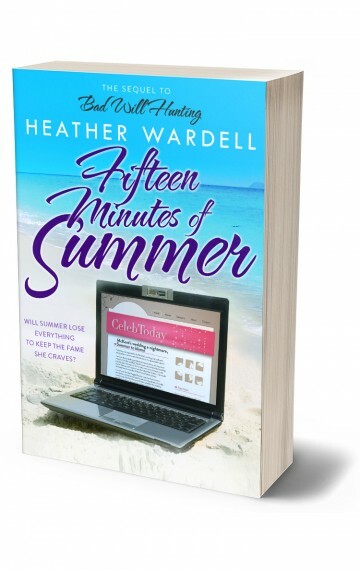 At the same time, she’s juggling her romance with show-mate Aaron and her growing friendship with Kent’s brother Ron and the pressure from her celebrity-gossip-site boss who’s demanding every intimate wedding detail Kent and MC would never want shared. If Summer shares those details with the world, she’ll get the attention and approval she’s always wanted, but she’ll lose her friends and the people who matter most to her. Are her fifteen minutes of fame worth the privacy they’ll cost? The sequel to “Seven Exes are Eight Too Many” and “Bad Will Hunting”!